What proportion of Americans say there is solid evidence that the earth is warming? Is it: a) one quarter; b) one third; c) a half; or d) two thirds? What has happened to that figure over the last four years? Has it: a) fallen every year; b) stayed about the same; c) risen every year? Judging by most conversations I have and the coverage of public views about climate change, most people would guess the answer is low and falling. But here’s the answer, taken from the Pew Research Center’s annual polls: two thirds and rising. Agreement in the US that the earth is warming is now higher than it’s been at any time since 2008. The research was conducted before Hurricane Sandy, so is probably higher now. Only about half say it’s because of human activities – though that has also increased by a quarter over the last three years. The debate about public views of climate change has changed in the US over the last few months. A number of polls in the autumn showed that the public is becoming more worried – and this was covered in the media. Everyone I speak to about climate change seems to think this. But, as I showed last year, concern about climate change in the UK is certainly not falling, and is probably increasing. I don’t know of a single poll that shows that the UK public are currently becoming more sceptical about climate change. The general pattern is instead that there was a one-off increase in doubts around late ’09 , which has been followed by a recovery over the years since then. There’s a debate to be had about whether the media is becoming more doubtful of climate science, though again I suspect the opposite has been true over the last couple of years. The narrative of rising climate scepticism has become entrenched well past its useful life. It’s time for some climate denial denial. The warmist case is that the world is warming due to human activity. Skeptics come in all shapes and forms, but given the amount of propaganda they have been exposed to, anyone who rejects that view is a presumptive skeptic. So how are in the numbers? In 2008 55% of people were warmists and 45% were not. 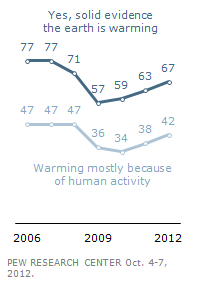 In 2012 43% of people were warmists and 57% were not. That looks like the warmists are losing and the skeptics are winning to me. It is also not what counts – it is not the public but the influential that count. God knows what people think about the death penalty and Europe has no effect. We can see the opinion formers don’t care because climate change has disappeared from the political agenda. It is no longer a viable political issue. Your response fails at the second word. What is happening is that those who have a counter view are finally getting heard, allowing debate instead of pronouncement. How about we not listen to average Joes or political schmoes and leave science to the scientists? Scientific consensus is what REALLY matters. I think you’re just in denial about the denial. In the end, if we as a race are too stupid to listen to scientists, ignore the evidence because we don’t understand it, and thus never take action to save our civilisation – I can live with us dying out. As the Daily Mash once noted – the Earth will be fine, it’s humans who need saving from global warming.